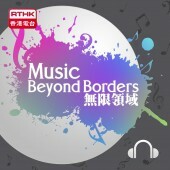 Type:AudioLanguage:EnglishCategories:MusicStatus:Programme end Description： The Music Beyond Borders @ 10 Anniversary Concerts are coming soon with a big change in venue - outdoors at the Hong Kong Cultural Centre Piazza C (as part of the New Vision Arts Festival 2012). The concerts will take place on 3 Nov (Saturday) and 4 November (Sunday) from 2:30pm to 6pm. Two past Music Beyond Borders artists return: Award winning Dutch saxophonist Yuri Honing, this time with his Wired Paradise band and, Austria’s Georg Gratzer and Beefolk, who gained quite a following on their last visit here. To mark the start of another 10 years of Music Beyond Borders to come, will be the Claude Diallo Situation from Switzerland, taking part in the project for the first time. Music Beyond Borders – there are no limits to where we can take you. In 2010 Mark Atkins, whose background is as diverse as the music he creates (Irish-Australian and Yamijiti), brought his Aboriginal stories and didjeridoo performance to RTHK. He is recognized internationally for his collaborative projects with some of the world’s leading composers and musicians and collaborated with members of the Hong Kong New Music Ensemble. Previously he co-wrote Voices for didgeridoo and organ with Philip Glass. The work was performed abroad at Lincoln Center (NY) and toured to Amman, Jordan. As a regular collaborator with Philip Glass, Mark has recently performed the ‘Qatsi Trilogy’ with the Philip Glass Ensemble at the Arts Centre, Melbourne – Glass’s scores to the Godfrey Reggio films. Mark Atkins is a founding member of the performance ensemble ‘Black Arm Band’ featuring Australia’s most respected legends of indigenous contemporary music who continue to perform Dirtsong, first presented to sold out houses as part of the 2009 Melbourne Festival - a powerful musical journey through Australia’s cultural heartland inspired by the words of Alexis Wright (Miles Franklin Award winner), set against a stunning backdrop of moving imagery and text. Mark is a prolific instrument maker, creating and painting didgeridoos from logs which he collects in the bush near his home in Tamworth, New South Wales. Exhibitions of his traditional and contemporary visual artwork have been shown in Japan, Europe and the United States. He has most recently performed at the Four Winds Festival (New South Wales) and with the Australian Chamber Orchestra’s ‘Reef Tour’ in Western Australia. 2012 also sees Mark performing with the Canberra Symphony Orchestra, The Black Arm Band, with the Philip Glass Ensemble at the Arts Centre, Melbourne and as part of the Oz Fest delegation touring India and Nepal. He has recently toured with the Australian Chamber Orchestra presenting The Reef. It will be presented in the Hong Kong Arts Festival in Mar 2013.